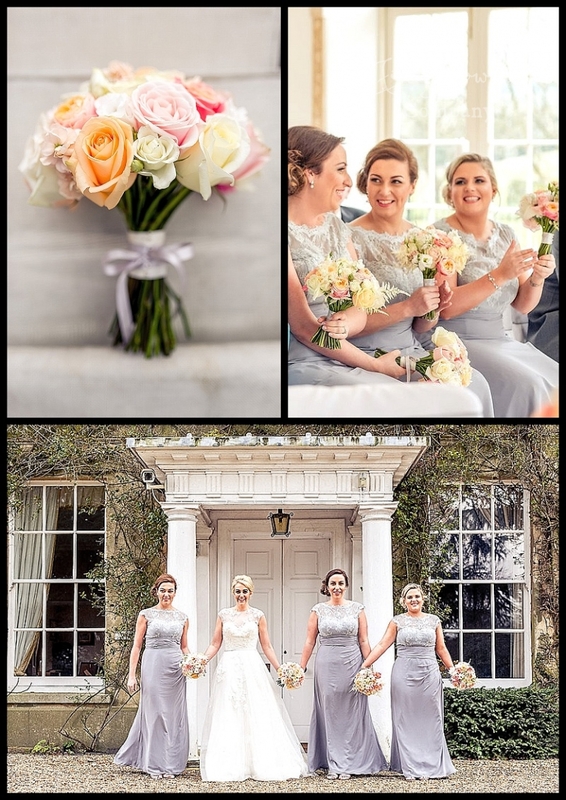 This pinky peach, coral and grey wedding at Northbrook Park, was sooooo gorgeously sophisticated – just the perfect balance of warm and cool colours. The grey element to echo the bridesmaids’ silver grey dresses, was subtly introduced with beautiful accessories such as paper pompoms, grey ribbon, stunning table cloths edged with grey roses, and lovely silver vintage votives. 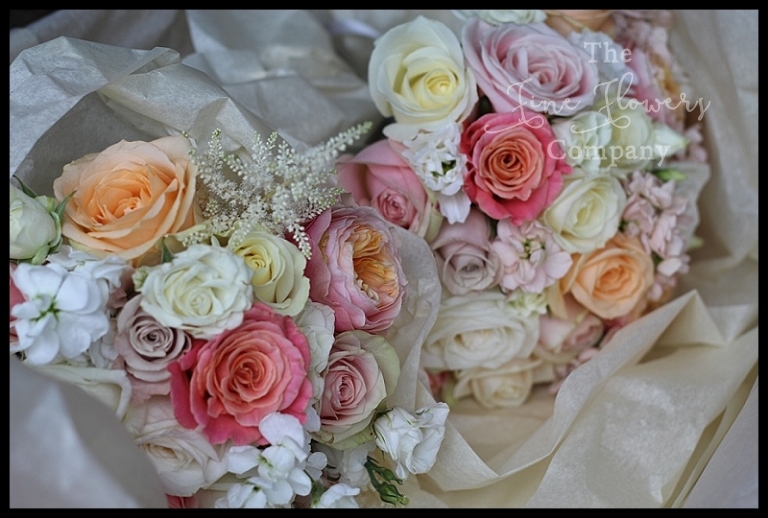 Emma chose a beautiful contrasting palette of warm blush, peach and coral, and cool silver-greys, and the overall result was so elegant… The bouquets all used Avalanche, Sweet Avalanche, Menta, Peach Avalanche, Vuvuzuella and Miss Piggy roses and apricot scented stocks. For the venue flower displays we added lots of textural ivory hydrangeas to create all-flowers, bloomy displays without any foliage – a really opulent look. As this no foliage look crammed with just flowers is as you might expect, more premium cost-wise, all flowers were made to work extra hard by being really versatile and being reused for both the ceremony and the wedding breakfast. Emma had enough tables to be able to make it more interesting, by opting for a mix of tall and low centrepieces which gave her plenty of flexibility. The 4 very opulent and dramatic tall vase centrepieces were used first in the Vine room, 2 at the start of the aisle and 2 framing the ceremony table, then they were moved through to the centre line of tables down the length of the summer room. 2 of the low centrepieces were used to dress the ceremony table, while 5 more were used on the bar surface at the entrance to the Vine room. The fireplace was styled with a series of pretty vases, all of which would later on dress the top table, together with the bridesmaids bouquets. Finally, the aisle was lined with romantic candle-lit storm vases and rose petals scatter. Here are some more photos from this elegant wedding at Northbrook Park, some of them thanks to Graham Nixon Photography. We are very familiar with this beautiful venue having done many weddings there in the past. 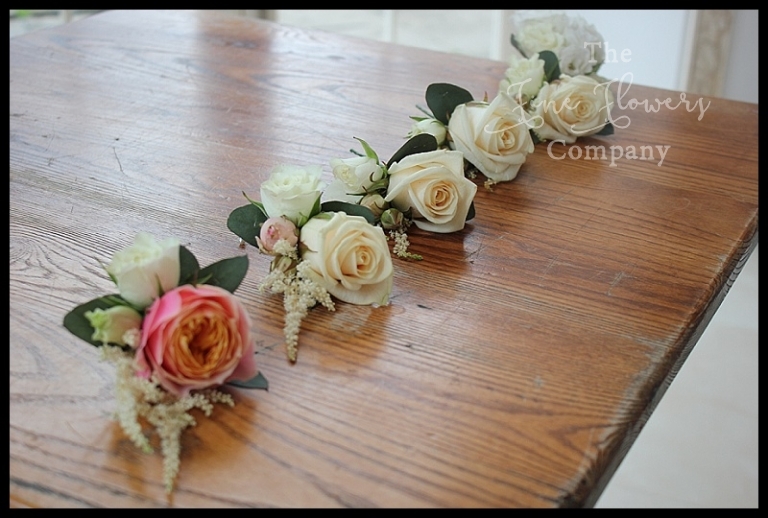 So if you are planning a Northbrook Park wedding and need some help where to start on the wedding flowers front, please visit our other featured Northbrook Park wedding pages and get in touch.